Home » Greenroom » The Disability Act: It Helps Your Business Too! The Disability Act: It Helps Your Business Too! According to the website Disabled World around 15% of the world’s population has some form of disability or the other. The proportion is roughly 1 in every 5 people in America. This could be a huge percentage of additional people visiting your business. In a people and service oriented establishment like a restaurant, a doctor’s clinic or a beauty parlour, you could increase your turnover by a significant percentage by simply providing access to disabled people who would otherwise prefer to go to the next establishment further down the street. The Australian Disability Discrimination Act 1992 (DDA) aims to promote equal opportunity and access for people with disabilities in Australia. It shares a common philosophy with disability discrimination acts around the world that emerged at the end of the 20th and the beginning of the 21st century. Like discrimination acts in many countries, the Australian Disability Discrimination Act protects individuals across Australia from direct and indirect discrimination in many parts of public life such as employment, education and access to premises. The complete list can be found in this guide by the Australian Human Rights Commission. What do building regulations state? The Building Code of Australia (BCA) requirements under Section D3 relating to disability access whereby all access ways and finishes within parts of a building required to be “accessible” must comply with AS 1428.1 Design for access and mobility Part 1 general requirements for access- Buildings. This states that all continuous accessible paths of travel shall have a slip-resistant surface. The Disability (Access to Premises-Buildings) Standards 2010 is Commonwealth legislation which tries to improve access and use of facilities so that they are accessible for all. The improvement in the design not only provides a safer environments, but help to facilitate community interaction by reducing barriers that may affect participation of disabled persons. Parts of buildings that are required to be accessible must have access ways to and within certain areas. An access way is defined as a continuous accessible path of travel as defined within AS 1428.1, which in turn requires an access way to be slip resistant. Whilst many may argue that slip resistance is not a specific prescriptive requirement, the requirement for slip resistance appears to be an inherent requirement as not to discriminate against those who may have difficulty walking on slippery and/or polished surfaces (for those with difficulty walking on highly reflective surfaces). These essentially require employers and those who have control (or part thereof) to show due diligence in ensuring that the risk of injury due to slips, trips and falls are reduced to as low as reasonably practicable (ALARP). The basic ideas is that every area and facility open to the public should be open and available to people with a disability. They should expect to enter and make use of places used by the public if people without a disability can do so. So what does this mean for your workplace? It is the responsibility of the business owner and the manager of the premises to make reasonable adjustments to the physical features to allow disabled guests to access and use the premises like people without disabilities. Physical features include everything from steps, stairways, entrances, floor surfaces and furniture. The judgement of reasonableness is left to common sense and varies from situation to situation. It is clearly the onus of the business owner to justify what is unreasonable in the given circumstances since there are not rule books to go by. Adherence to guideline would depend upon whether the building is being constructed or has already been constructed. 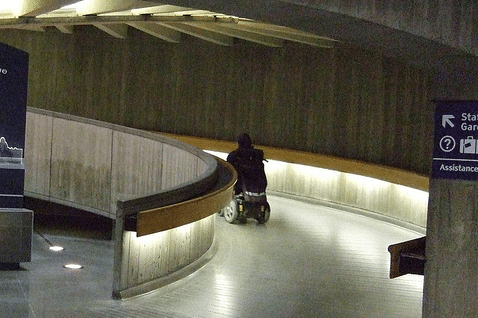 If a building or workspace is not yet constructed, the design of the building must ensure must be mindful of the requirements for disabled people. Floor materials should not create a trip hazard. The floor surface should help to remove rain water from shoes and wheelchairs. Where mats are provided, the surface of the mat must be level with the surface of the adjacent floor or the sides should be bevelled. However, if the building is already constructed, then alterations may need to be done, whether at staircases, floors or furniture layout and design. Introduce slip resistance to give firm foothold and good wheel grip under all wet and dry conditions. The ingress of moisture should be reduced to the lowest level possible through the use of floor mats. Slopes and landings of ramps should have anti skid material to grip wheels or help provide a firm foothold. It is your responsibility to make your premises as accessible as possible. Failure to do so in not only against the law, but also incredibly inconsiderate and bad for business. Alsco can provide you advice on most appropriate mats for enhancing access for the disabled. Ask Alsco for a free audit of your premises now.